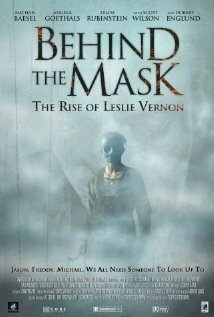 Last week we watched the movie Behind the Mask: The Rise of Leslie Vernon. It’s a horror-comedy, half mockumentary about a wannabe serial killer who is preparing for his first attack, and half horror movie once those attacks actually begin. I enjoyed this movie so much. As an actual horror movie, it’s definitely nothing special, but as a look “behind the scenes” at what it takes to be a horror movie star (and by this I don’t mean as an actor, I mean what it takes to actually be Freddy or Jason) it was awesome. For example. There is a typical horror movie scene…girl is taking garbage out from her work. She props a door open with a loose brick, and takes garbage to a dumpster. Something rustles in the trees. She looks, thinks she might see someone, and then suddenly the door behind her closes of its own accord! She jumps, and looks back into the trees, but there is nothing there. Freaked out, she heads back inside. Now to the behind-the-scenes. Our killer, Leslie, watches the girl for a long time so he knows her routine, and knows she’ll be taking out the garbage. He ties fishing wire around the brick, so he can pull it away from the door at the right moment. Then he rustles the trees, appears briefly to scare her, sets off the brick, and then jumps back into the trees. At this point, he just wants to make her a little paranoid, see! Anyways, I have a point here. This movie made me rethink the whole aspect of coincidence in stories. Most stories have some level of convenient placing or happenstance. Sometimes this has to happen, because things need to have some kind of starting point. But what if, instead of coincidence, there was an entire additional, purposeful layer to the story instead? What if, instead of that girl accidently spilling her drink down her shirt, thus gaining the attention of the cute boy at the restaurant who helps clean her up, there was instead another employee who purposefully tampered with the cup in the first place, and told the cute boy to refill the napkin dispenser at the very moment the girl sat down at a table? I don’t think this has a place in every story, and I know there are already some stories out there that do at least a bit of this. But it’s got me thinking that it’s worthwhile to take a closer look at my own writing in the future, because perhaps there is more to the story than even I’m seeing! That is a really cool way to look at things, a behind the scenes character making the world turn to their own music. I think this is a great post! And I love when a seeming coincidence in a story turns out to be anything but. It's a trick I've used many times in my own writing. It adds such a cool layer to the story when even the small things turn out to be plotted instead of random!